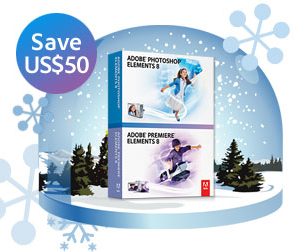 $50 discount for Photoshop Elements 8 and Premiere Elements 8 Bundle (Windows). Only $99 after US$20 instant discount and US$30 mail-in rebate. $50 discount for Photoshop Elements 8 Plus and Premiere Elements 8 Plus Bundle (Windows). Only $129 after US$20 instant discount and US$30 mail-in rebate. $40 discount for Photoshop Elements 8 (Windows). Only $59 after US$20 instant discount and US$20 mail-in rebate. $40 discount for Photoshop Elements 8 for Mac. Only $59 after US$20 instant discount and US$20 mail-in rebate. Great tip Jpax! If you have access to Best Buy and use the Windows version, check this out. CostCo has it for $49.99. As usual this is NOT available here in the RIP OFF UK - Adobe want a COOL Â£75.84 (approx $126!!!!) and no discounts offered. Go to amazon.co.uk to buy this great piece of software for Â£50.97 (approx $84.62) and bypass Adobe. Great software rip off prices here in the UK. Klasse Weblog - Habe "a little Question". Mein Ego ist auch augenblicklich dabei meinen kleinen Weblog aufzubauen und ich finde dein Design schÃ¶n. Wo kann man das herbekommen?